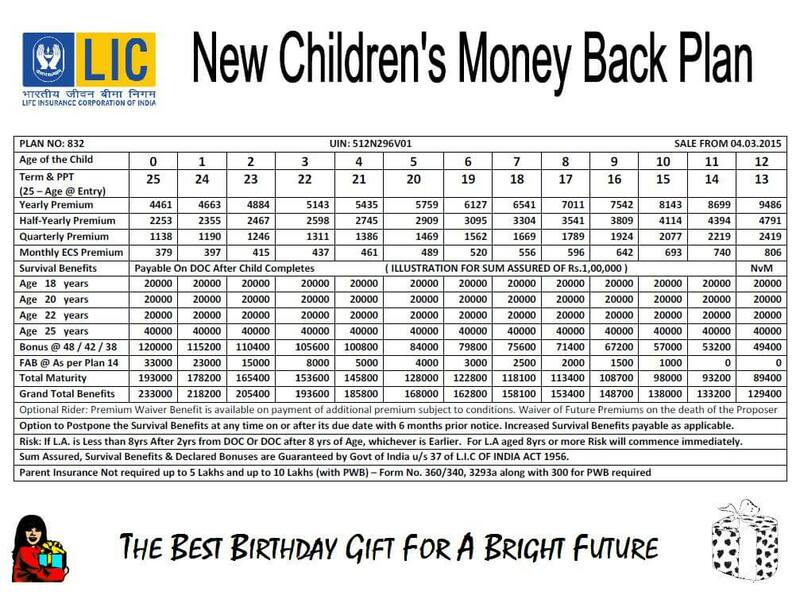 LIC has launched a New Children?s Money Back Plan (Table No. 832) which is a non-linked, with profits and regular premium payment money back plan. The plan aims to meet various financial needs like education, marriage etc. of the child through Survival Benefits. The plan will be open for sale for a maximum period of 90 days from the date of launch i.e. 4th March, 2015. Modes of Premium Payment: All modes i.e. Yearly, Half-yearly, Quarterly and Monthly. 1. In case the death of the child occurs before the commencement of risk i.e. before the child turns 8, then an amount equal to the total amount of premium paid excluding taxes shall be payable. In no case, the death benefit shall be less than 105% of the total premiums paid up to the death. Loan: Loan facility is available after the full payment of premium is made for 3 years and loan should be for the benefit of the Life Assured. 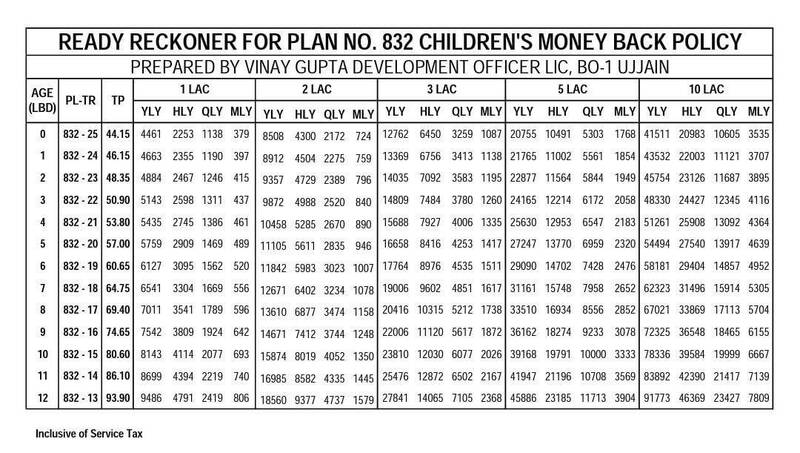 LIC Childern?s Money Back Plan (Table 832) ? Should I buy? As per my opinion, this plan will not suffice?the purpose of buying it i.e. securing your child’s future. With the return of 5% to 6% ? (maximum of 7%), this plan does not even beat the inflation. Although there is a benefit of insurance coverage but these types of plan are not bought considering the child may die in policy term. Instead of buying this?Children?s Money Back Plan, you should invest in other debt instruments like Mutual Funds, Bank Fixed Deposits, Public Provident Fund, Sukanya Samriddhi Account etc. which gives better return of 9%, higher than this plan and also gives a tax-free return with 80C deduction on the contribution. Sir Mera baby 15 Month ka hai muje uski policy niklwani hai konsa plan uske liye shi rhega mera age 25 years hai. An amount equal to the total amount of premium’s paid excluding taxes, extra premium and rider premium, if any shall be payable. Death Benefit, defined as sum of ?Sum Assured on Death? and vested Simple Reversionary Bonuses and Final Additional Bonus, if any, shall be payable. Where ?Sum Assured on Death? is defined as higher of 10 times of annualized premium or Absolute amount assured to be paid on death i.e. Basic Sum assured. 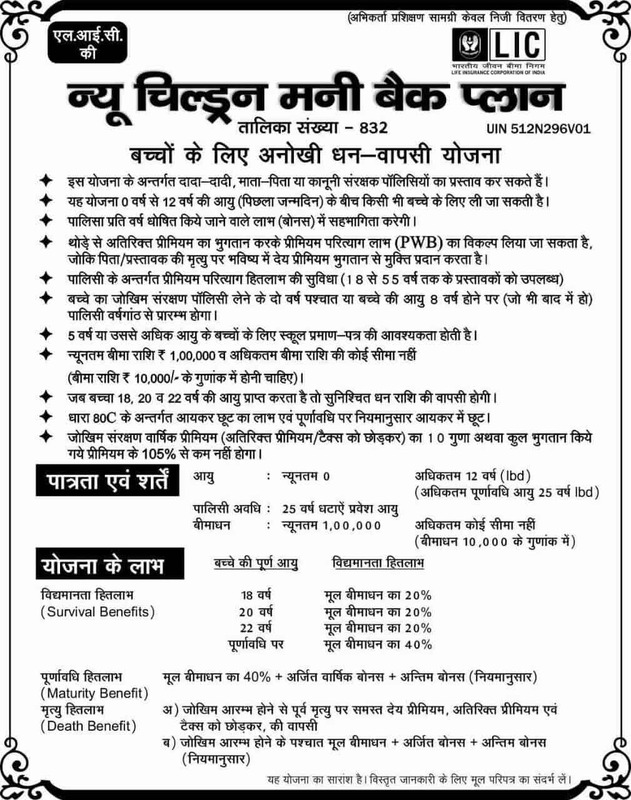 This death benefit shall not be less than 105% of the total premiums paid as on date of death.
? Premium paid under this plan is eligible for TAX rebate under section 80c.
? Maturity under this plan is free under sec 10(10D). Please tell me about the lic children money back policy. Pls explain steps of create new account in LIC and also explain rules & regulations. Sir, can a widow self employed filing ITR for last 3 years be the proposer under this plan…..age of widow 40 years,age of child 4 years…Please reply as soon as possible…. Yes, proposer can be anyone from grandfather, grandmother, mother, father or legal guardian..
age 5, what is death benefits? What about tax benefits u/s 10(10D) as there is only provision of return of premium before commencement of risk Which is less than 10 times of annualised premium. How come?? Because if you take policy of sum assured of Rs.10 lakhs for 1 month child, even after the risk commencement period, the premium (Rs.91773 in 12th year) is less than 1/5th of the sum assured. Sir meri ldki h 11month ki. Uski lic krwa akte h.
Yes, you can. The eligibility for this scheme is 0 to 12 years. what prem 1 lack sum. Dear Bharat ji please give me age of your son/daughter and you and send a quotation for your information and give me mobile no. What is Premium Waiver Benefit? Please sir explain it. Premium Waiver Benefit means in case of death of proposer, usually guardian, the future premium payment gets waived off.